This chic contemporary sleeper sofa is perfect for your modern home, condo, or apartment. 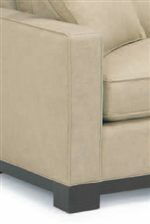 This elegant piece features wide track arms, welt cord trim for a tailored look, plush high quality cushions, and a sleek wooden base with block feet. Sustainably built in North Carolina, this durable sofa will stand the wear and tear of everyday use. Easily accommodate overnight guests with the pullout queen size mattress.This piece is available as a standard sofa or queen sleeper sofa. The 0555 Contemporary Queen Sleeper Sofa with Track Arms and Wood Base Rail by McCreary Modern at AHFA in the area. Product availability may vary. Contact us for the most current availability on this product. Tailoring Clean tailoring with welt cord trim.